Time Spent; complete jam with Paul Kossoff as the last track of the last CD. Produced by John Martyn and Paul Kossoff. The full 18 minute jam which ensued after a session to re-record Martyn's May You Never, as a proposed single, was abandoned. The rhythm section was Tetsu and Simon Kirke. The final section of the performance (11:26 - 17:06) appeared on the Kossoff solo album - Back Street Crawler. Songs Of Yesterday is an amazingly well produced 5 CD box with rare Free material. John himself liked the group very much when they were hot. Time Spent was partially released as Time Away on Paul Kossoff's first solo album Back Street Crawler (1973). Time Spent was recorded 19 November 1971 at Basing Street Studios, London and based on the chords of JM's So Much In Love With You. Over The Green Hills (new mix); Walk In My Shadow (alternate 'old' mix); Wild Indian Woman (new mix); Guy Stevens' Blues (unreleased); Visions Of Hell (unreleased); I'm A Mover (alternate mix); Moonshine (alternate mix); Woman By The Sea (unreleasedl); Free Me (alternate version); Long Tall Sally (unreleased); Broad Daylight (alternate mix); The Worm (B-side); Trouble On Double Time (alternate version); Spring Dawn (unreleased); I'll Be Creepin' (alternate version); Sugar For Mr. Morrison (B-side); Songs Of Yesterday (new mix); Woman (alternate version); Mourning Sad Morning (new mix); Fire And Water (alternate mix). All Right Now (alternate version); Oh I Wept (alternate mix); Remember (new mix); Don't Say You Love Me (new mix); The Stealer (full version); The Highway Song (alternate mix); On My Way (alternate mix); Sunny Day (new mix); Ride On Pony (alternate mix); Love You So (alternate mix); Soon I Will Be Gone (alternate version); My Brother Jake (new mix); Makin' Love- Only My Soul (unreleased); Rain (unreleased); Get Where I Belong (alternate version); Only My Soul (B-side); Travelling Man (alternate mix); Molten Gold (alternate mix). Little Bit Of Love (alternate mix); Soldier Boy (alternate mix); Sail On (alternate version); Guardian Of The Universe (demo); Child (alternate mix); Honky Tonk Women (rehearsal); Lady (rehearsal); Muddy Water (demo); Heartbreaker (live); Wishing Well (alternate mix); Let Me Show You (full version); Let Me Show You (B-side); Muddy Water (alternate mix); Common Mortal Man (alternate mix); Heartbreaker (alternate mix); Seven Angels (alternate mix). Ride On Pony (Croydon 2nd show); The Stealer (Croydon 1st show); Be My Friend, Fire And Water, Don't Say You Love Me, Mr. Big (Croydon 2nd); I'll Be Creepin, Free Me, Woman, I'm A Mover, Walk In My Shadow; Songs Of Yesterday; All Right Now; Crossroads (Sunderland). "You get 3 CDs of [almost all] alternate versions/ mixes in chronological order, one of [almost all] unreleased live stuff and a bonus CD of solo/ offshoot bits and pieces. Very little on this box is a previously released version/mix, only a few singles and B-sides. This one is aimed straight at the enthusiast/ collector/ completist, which has caused some criticism, but there are numerous 'best of' collections available (at least four in the UK), and All Right Now is on just about every rock compilation ever made [ARN does appear here, as an early version with an a cappella vocal start]. The remastered sound is generally great except for a few things dubbed from records/ tapes, which appear in 'best ever' quality. A lot of the tracks have the studio count-ins and chat etc. Several of the 'alternates' sound very similar to the released versions unless you're familiar with the track, but there are many surprises- the Tons Of Sobs sessions yield a raucous Long Tall Sally jam and a faster version of Free Me as well as Guy Stevens' Blues which is guitar-and-organ twelve-bar at its best. There are several unreleased compositions- Visions of Hell from the Tons Of Sobs sessions, Spring Dawn from the second album rehearsals, a fascinating acoustic Fraser/ Rodgers duet. The compilers' determination to stick to the previously unavailable means that one or two key Free tracks (The Hunter, Heavy Load, Come Together In The Morning) don't appear as no [usable] alternate version could be found, which does feel a little strange. The live material on CD4 comes from the Croydon and Sunderland gigs from which Free Live was taken, but new technology means that various technical gremlins which previously spoilt part of the tapes have been erased. This stuff is killer- especially the slower ones like Don't Say You Love Me and Free Me, a whole different ball game live. The Croydon recording sounds slightly odd in that there's very little audience noise because the microphones weren't working- so it's like they're in your living room. CD5 has stuff by Peace, Kossoff/ Kirke/ Tetsu/ Rabbit, Sharks, a couple of Rabbit demos, a proposed single by Paul Rodgers and the Maytals and an 18 minute jam from Kossoff, Kirke, Tetsu and John Martyn, part of which appeared on Kossoff's solo album Back Street Crawler as Time Away. 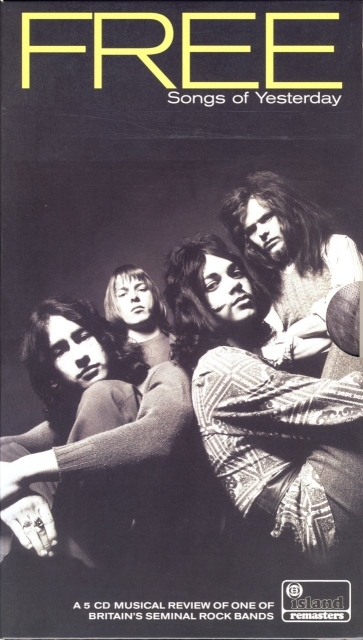 There is nothing by Toby or the Fraser/ Miller band because Andy Fraser refused, for reasons unknown, to sanction the release of a whole chunk of material. If you just want Free's 'prime cuts' there are better and cheaper ways of getting them- Songs Of Yesterday isn't an introduction or a Best Of- but if you like Free you'll love this."